Post-it notes can be used for a lot more than just jotting down reminders. The colorful pieces of sticky paper make the perfect medium for art projects and pranks alike. 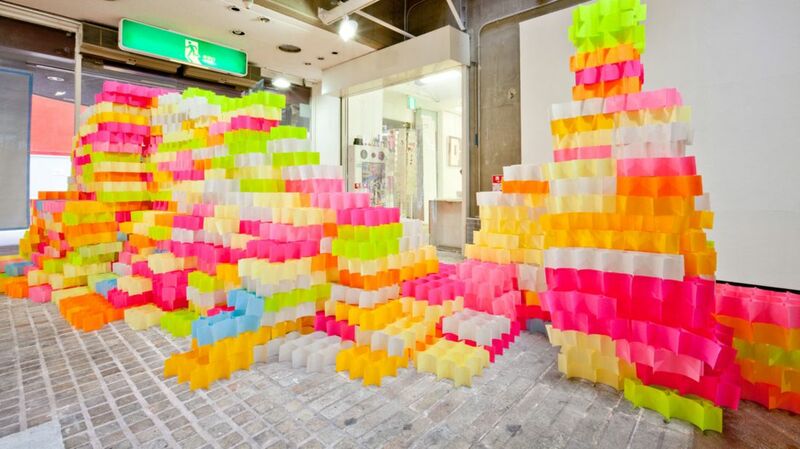 Back in 2001, Japanese architect Yo Shimada decided to use the office supplies as building blocks. With the help of students from Kyoto University of Art & Design, he created a large structure made out of 30,000 multi-colored Post-it notes over the course of three days. The paper already has an adhesive strip, so no other materials were needed to connect the pieces. Four Post-Its were stuck together to make star shapes, which formed larger patterns. The cells were then stacked to create the impressive structure. Although the ultimate paper craft is no longer standing, photos of the project recently made the rounds online. Check out the finished product below. All images courtesy of Yo Shimada.